San Rocco II is located in the Calabrian region of Italy, far far south on the east coast facing the Ionian sea. Isca Marina is a beautiful unspoilt location which resides only 5 minute walk to the local village of Isca. Here you will find local shops, supermarkets, green grocer, bakery, butcher, post office, ATM, DIY and a chemist. There are a few coffee shops and a bar/internet café (Friends Café – Salvatore Mirarchi) also. A large in door swimming pool is located just beside the resort. Isca beach is a 2 min walk from the resort gate. This is a beautiful stretch of white sandy unspoilt beach. In the immediate beach vicinity there are 2 large beach bars (VIP) which are open all summer. There is also a number of beach bars, clubs and restaurants open within walking distance along the beach road. During summer months they provide live entertainment, good food and drink. During the summer months it is possible to walk along the beach road and access the nearby Sant’Andrea beach where additional bars, restaurants and entertainment can be found. Bicycles can be rented locally at the petrol station in Sant’Andrea giving you the freedom to explore off the beaten tracks and get some wind in your hair while seeing the beautiful rural countryside. The town of Soverato is about a 15-20min drive away where you will find a bustling town with boutique shops, cafés and restaurants. Along the long promenade during the summer months you will find something for all ages, old and young. There are fairground rides, trampolines, ball pools, beach bars, restaurants, clubs and road stalls. On Friday’s between 8am-12.30 there is a large street market where you can buy almost anything. The vendors are more than happy to barter for everything. Surrounding the resort location there are many mountain side villages with stunning mountain and sea views. These quaint villages with their narrow streets and 15th century churches and architecture are a great way to spend an afternoon. Sure why not have a rich relaxing cup of espresso or even a cold beer while looking over the beautiful coast. On the resort complex itself there is a large outdoor swimming pool and childrens pool currently in development and nearing completion. The resort itself is a secure gated complex with a large carpark located adjacent to the 2 two bedroom apartments. Night lighting is also in place in the complex which is also currently nearing full operational capacity. - Airport transfers (TRANSFER TO/FROM ISCA – AIRPORT LAMEZIA TERME A CAR FOR 4 PERSONS €75. A MINIBUS FOR MAX 8 PERSON €120). 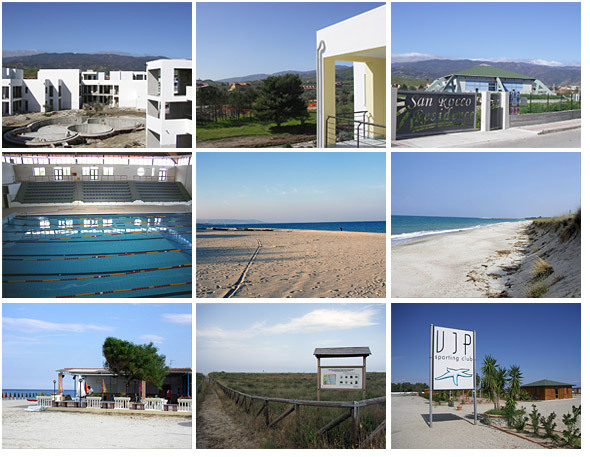 - They will do a shuttle service for up to 8ppl to the local town of Soverato. In the morning from 9am and return 12:30/1:00pm. Return journey will be €10pp. After 1pm until night (times are negotiable) will be €15pp return. (Prices may vary. Quote: Karl Greene – Venture3properties.com for best price available). Lamezia airport is the nearest airport located 1 hour north of Isca. Low cost airlines service this airport. Ryanair has regular weekly flights. Catania airport, Sicily have direct Aer Lingus flights from Ireland during the Summer months. Catania airport to San Rocco II includes a 20min approx. ferry ride from Messina to Villa San Giovanni can take less than 4 hours total depending on traffic, tolls and ferry crossing. Ferries are very regular during peaks season. Ferry tickets are available at the port. Opening hours correspond to the departures. Reservations are not possible and necessary.